What are you afraid of? 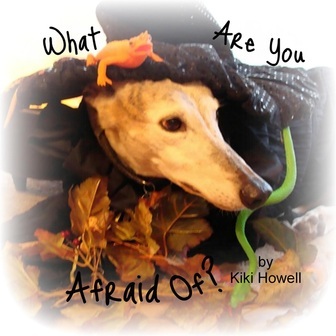 by Kiki Howell, is a cute story about two dogs, Drake and Zoe, who are having a conversation about the fears that poor Drake has. The story is set during Halloween, but can be read anytime of the year. This story tries to touch on fears many children have, and is a cute way to show them that it is ok to be afraid, but that they should share their fears with someone they trust. Poor Drake is scared of kids in costumes, but loves when his boy drops yummy candy. I can see how little ones would love the adorable pictures of Drake and Zoe in this story. Although I personally found the rhyming a bit forced, this is an adorable book for young children. My 3 year old kept wanting me to read it over and over, and she loved looking at the pictures throughout the book. What Are You Afraid Of? is more than a story to help children overcome their fears. What Are You Afraid Of? is a book about acknowledging a children's fears and dealing with them in ways that do not stifle a child's imagination and creativity. So, indulge me while I state a few ideas. Children can easily be made to feel small and defenseless in this big world, while at the same time, children have very vivid imaginations, which can cause further anxiety over things that are intangible, confusing, and scary. Therefore, how we deal with a child's fears may have tremendous implications on how we foster, or hinder, their creative growth. While fear can be a manifestation of imagination, so too can compassion and empathy. Compassion is a product of the imagination as well, being able to ‘see’ ourselves in another’s shoes. So, it only stands to reason, that if we stifle the imagination, we may be stifling the child’s potential to care for the world around him later on. A creative mind is a terrible thing to waste. We all know that fears or phobias cannot be easily coerced away by mere rational or logical arguments. Instead, it seems a better approach to acknowledge a child's fears and show him or her that you know how he or she feels. We can try to diminish the fears by making light of it and making the child laugh. Ah, laughter is the best medicine! I have read psychologists who recommend playing with fears by role playing until the child laughs or by drawing silly pictures of the object of the fear with the same intention. With all of this in mind, I came up with this story. I hope the idea of a big dog being afraid of witches and ghosts is silly enough to begin with, along with the playful Halloween-ish images and the funny rhyming patterns. But more, I hope the games the old comes up with will be games your child can also play to eliminate his or her own fears. Most of all, I wish for you and your child to enjoy the story. May you laugh! "What are you Afraid of? by Kiki Howell can be found at Amazon and Barnes and Noble websites. *I received and ebook copy for review purposes through the Virtual Book Tour Cafe. See my Policy & Disclosure Page for more info. This sounds like a wonderful book for kids. So many kids have such a winde variety of fears and this books seems like an excellent way to get kids talking about their fears. It also allows them to see that having fears is okay. My co-author is an elementary school teacher. I will pass this title on to her. Great review!